Be honest now. When you get your personal feedback as part of your performance appraisal each year, do you pay more attention to the comments made about your strengths or the ones about your weaknesses and ‘development areas’? If my experience is anything to go by, the majority of us spend a great deal more time thinking about what we need to get better at, than the things we are already good at. This tendency is understandable and, in many ways, laudable. We are all keen to learn and to develop our capabilities and qualities. By embracing what others believe we need to improve and focusing our efforts on doing so in practice, we have the opportunity to strengthen our performance over time. This in turn increases our chances of career success and of raising the esteem in which we are held in the eyes of others, as well as our own self-esteem. But in bringing this mindset, we run the risk of making one big and potentially life-changing mistake. In order to live our lives to the full and to feel a sense of enjoyment and fulfilment along the way, our first priority must be to understand and make the most of our strengths. What are the qualities, skills and aptitudes that make us stand out? And how can we best leverage these in the jobs and career paths we select? I would go one step further by pointing to an important paradox. The more I have learned about leadership development, the more I have come to the view that the best way to address our weaknesses is actually to focus first on understanding and appreciating our strengths. And the reason is that in many cases the sources of our strengths are also the sources of our weaknesses too. The two are inextricably linked. As human beings, each of us has a unique bundle of motivations and fears that help determine how we behave. Some of us may be driven by a desire for power or achievement, motivations that are often accompanied, deep down, by a fear of failure. People with this profile tend to be assertive, driving, forceful and proactive. These can all be tremendous strengths in a commercial context, but to others they can also come across as controlling, overbearing or egocentric if they are overplayed. Other individuals may be more people and influence-orientated, a profile that is often associated with an underlying fear of personal rejection. Their style will typically be more amiable, collaborative and persuasive. But this relationship-based approach can have its downsides too, with a risk of being perceived as over-enthusiastic, superficial or too responsive to the thoughts and feelings of others. There are as many different behavioral profiles as there are people on the planet. A key priority for each of us as leaders is to dig deep into the things that make us tick personally, so that we discover for ourselves the sources of our own distinctive potential strengths and weaknesses. This can be done by using a variety of psychographic and behavioural profiling techniques, as well as by actively seeking the perspectives of the people we live and work with. By building our awareness and understanding of our natural leadership style, we will be better able to channel it in ways which suit the needs and styles of the people we work with. 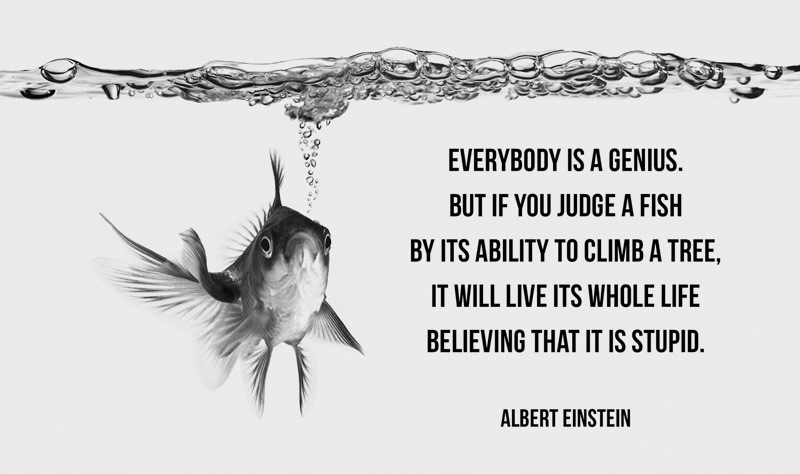 More importantly, to avoid the fate of Einstein’s fish, we will also be better placed to choose the leadership roles and challenges that suit us best in the first place.